The RSPCA has condemned an attack in which a greyhound was shot in the head and its ears cut off before being dumped alive on a south Wales mountain. The incident was called "barbaric" by a spokesperson for the charity who said the "deeply distressed" animal may have been a racing dog. Its ears, probably tattooed, had been cut off to stop identification. The greyhound was put down after being found by a person walking their dog near Fochriw in the Rhymney Valley. The animal which had been shot in the head, possibly with a nail gun, was discovered last Sunday. A post-mortem examination found the dog has severe brain damage and his jaw had been shattered. "This is a shocking, horrific incident. The greyhound has suffered immensely," said RSPCA inspector Simon Evans on Friday. The animal group is investigating the attack along with Greyhound Rescue Wales and the three Welsh greyhound tracks. "Whoever carried out this barbaric act may have though the dog was already dead when they dumped him," said Mr Evans. "I believe the culprit chose the location very carefully, hoping the greyhound would never be found. The animal had probably previously been a racing dog, and had simply out-served his purpose, he added. "If so, the dog would have had tattooed ears to identify it, but these had been cut off". 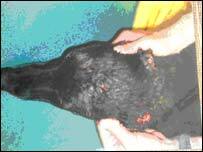 The black greyhound had distinctive markings on its chest and neck. There was also an unusual large scarred area on its back, between the shoulder blades where its coat was patchy with some white hairs and some skin visible. Appealing for anyone with information to come forward - anonymously if necessary - Karen Thomas, chair of the charity Greyhound Rescue Wales, said most people would be "shocked and disgusted" at this crime. "Animal rescue organisations and the greyhound racing industry in Wales are sending a clear message to the people who did this," she said. "It will not be tolerated and you will not get away with it." Posters showing the dog's distinctive markings are to be displayed at greyhound tracks in south Wales. Anyone with information can contact the RSPCA cruelty line on 0870 5555 999.